A recommendation engine (sometimes referred to as a recommender system) is a tool that lets algorithm developers predict what a user may or may not like among a list of given items. 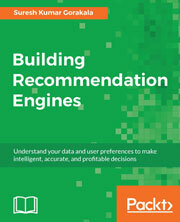 Recommender systems have become extremely common in recent years, and are applied in a variety of applications. The most popular ones are movies, music, news, books, research articles, search queries, social tags, and products in general. During the course of the book, you will create simple recommendation engine, real-time recommendation engine, scalable recommendation engine, and more. You will familiarize yourselves with various techniques of recommender systems such as collaborative, content-based, and cross-recommendations before getting to know the best practices of building a recommender system towards the end of the book!